Pines tahe are affected include, A. apiculata (Virginia pine), A. arizonicum (ponderosa pine), A. pinicola (Austrian, lodgepole, Scots, sugar, eastern white, and western white pines), A. piniphila (Bishop, jack, loblolly, lodgepole, ponderosa, shortleaf, Virginia, western white, and whitebark pines), A. tingens (Austrian, cluster, jack, loblolly, lodgepole, pitch, pond, ponderosa, red, Japanese red, sand, Scots, shortleaf, slash, Table Mountain, Virginia, and eastern white pine). These diseases are found throughout the continental United States. Contibuting to the spread are poor sites and overcrowding. Symptoms vary with species, region, and site. “Flags” of brown needles appear throughout thin crowns. Partially girdled branches appear healthy, but die after complete girdling. Perennial cankers are almost oval, the bark usually remaining on their faces. Surrounding tissue becomes sunken with little shriveling and no separation. 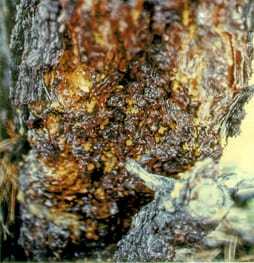 “Target” cankers usually result. Beneath the face of the canker is a characteristic blue-black discoloration of the wood and masses of cup-shaped fruiting bodies (apothecia). Young trees are attacked most severely. Ascospores dispersed by wind during summer and early autumn invade branches and twigs through wounds. A telltale mark of tiny brown spots, each with a drop of resin, is left at each invasion site. Dark brown mycelium permeates the sapwood to cause a blue-black stain. Eventually, apothecia develop singly or in groups and release ascospores within. This process continues annually as the canker expands.